Online gaming firm Dream 11 became India’s first gaming ‘unicorn’ after a secondary investment by London and Hong Kong-based Steadview Capital, driving its valuation over $1 billion. Harsh Jain, the chief executive officer and co-founder of Dream11, eyes further growth with this investment. Its user base has grown at a compound annual growth rate of 230 percent. The fantasy sports platform leads the market with over 50 million users, which it hopes to double by the end of 2019. Jain, along with Bhavit Sheth, started Dream11 in 2008 as a fantasy sports platform which let users create their own virtual teams with real players for cricket, kabaddi and football among other sports and help them organise matches. One can make a team before an actual match and pick players who they think will perform the best. And, on the basis of the performance of these players in the real match, you can accumulate points and get a ranking when the game ends. You can win cash prizes based on your ranking. It was an ad-based sports app and free for all users when it started out, but that business model did not work out for long. The company then launched a freemium model wherein free features were made accessible to users till a point and after that, they had to pay. It worked as revenues rose with growing users. The company still follows the same model. Not just gamers in India but top investors around the world like Think Investments, Multiples and Kalaari Capital started taking interest in the platform. Just last year, it raised $100 million from China-based Tencent at a valuation of $700 million. The platform hosts nearly 3,000 games a year or nine games a day. 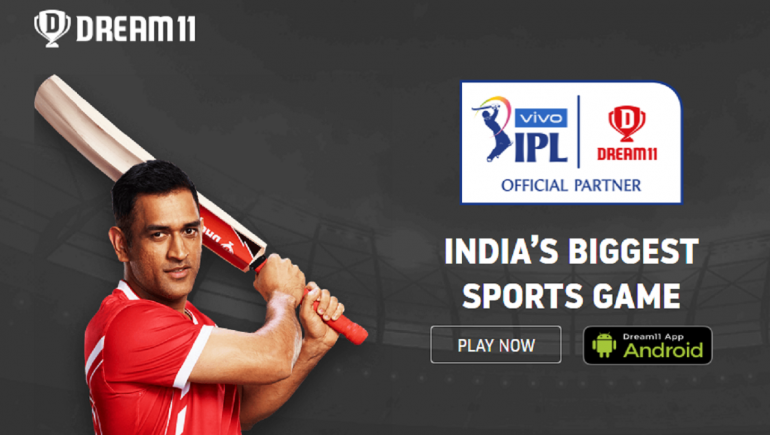 Dream11’s gaming app is not available on Google’s Play Store as Google does not allow apps offering cash contests on its platform. The app can only be downloaded from Dream11’s website. Only 15 percent of players on Dream11 have paid as of now, which has grown from 5 percent a few years ago. The others are availing the service for free. The company has a 90 percent share in the fantasy gaming space, according to a KPMG report. However, Jain believes Dream11 is more of a sports company than a gaming company. Jain’s next focus is their content website called SportsGuru, designed to help users with detailed research, analyses and information about matches and teams. Former Indian skipper Mahendra Singh Dhoni endorses the brand. Dream11 also entered a four-year partnership with the BCCI this year. It is associated with the Indian Premier League (IPL), International Council of Cricket, Pro Kabaddi League, Indian Super League, National Basketball Association, Caribbean Premier League, International Hocket Federation and Big Bash League. “We believe that Dream11 is poised to become the leading sports company in India catering to everything a sports fan needs. Its phenomenal growth track record and strong engagement is a testament to the consumer love for the platform,” Ravi Mehta, Managing Director of Steadview Capital, said. The company met legal hurdles along the way due to similarities between fantasy sports leagues and gambling, which is illegal in India. The legitimacy of the platform was questioned at the Punjab and Haryana High Court. The court, however, ruled that fantasy gaming is not gambling as it requires skill to choose a team based on their current form and performances. Nevertheless, rules vary from state to state. Jain even helped establish a body called the Indian Federation of Sports Gaming (IFSG) in 2017 to come up with self-regulation before the government releases its own rules. Over 50 gaming platforms are a part of this body. Dream11’s success in the industry may serve as an example for other entrepreneurs looking to tap into the fantasy gaming industry. Fantasy gaming in India is growing at a CAGR of 28 percent to touch $1.2 billion by 2022. The industry is supported by increasing data penetration in the country, cheaper internet and increasing disposable income in the country. The number of internet users in the country was 560 million as of January 2019, which makes India a huge market. The cost of building this business is also low, which makes it attractive for new players.